Some images, reportedly originating from the website of Hollywood special effects company Reel EFX (but since pulled), look like they could be our first look at the next Call of Duty game. Or at least some parts of it. 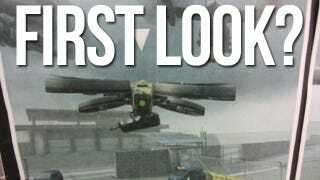 For a while now, Activision has been teasing the game with shots of a gun-toting "quadcopter", both in internet videos and on the game's website. Well, these images - which look like screenshots printed out and pinned up on a board - also star a quadcopter. There's not much more to the shots, but they look almost certain to be in-game (or at least in-engine) shots, supplied by Activision for reference. According to the video in the gallery, Reel EFX built and supplied the model used in FPS Russia's earlier video.